Bucaramanga (Spanish pronunciation: [bukaɾaˈmaŋɡa]) is the capital and largest city of the department of Santander, Colombia. Bucaramanga has the fifth-largest economy by GDP in Colombia, has the highest GDP per capita in Colombia, has the lowest unemployment rate and has the ninth-largest population in the country, with 521,857 people. Bucaramanga has over 160 parks scattered throughout the city and has been given the nickname "La Ciudad de Los Parques" ("The City of Parks") and "La Ciudad Bonita de Colombia" ("Colombia's Beautiful City"). 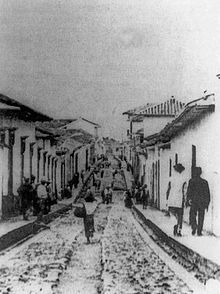 Girón was the first and most significant town founded by Spanish colonizers in the region, and Bucaramanga (founded on December 22, 1622) did not overtake Girón in population or economic significance until the early 19th century. The city attracted a core of German merchants and adventurers in the 1860s and 1870s (the most famous of whom was Geo von Lengerke) and tensions between the newcomers and local merchants flared in 1879, when the event named "La Culebra Pico de Oro" (The snake of gold beak) occurred. With the political reorganization of 1886, Bucaramanga replaced Socorro as departmental capital. The region (although not the city itself) was devastated by the civil war of 1899–1902—commonly known as the Thousand Days War—causing Bucaramanga to grow only modestly in the first half of the 20th century. Bucaramanga is located on a plateau in the Cordillera Oriental of the Colombian Andes, and many residents occupy unstable lands descending steeply from the meseta. Westbound of it, the Rio de Oro Canyon is located at an altitude of 600 metres (2,000 ft) above sea level. Eastbound, the Andean Range rises up in high peaks, reaching almost 3,700 metres (12,100 ft) AMSL in the place locally known as "Paramo de Berlin". The city is located at 7°08′N 73°08′W﻿ / ﻿7.133°N 73.133°W﻿ / 7.133; -73.133. 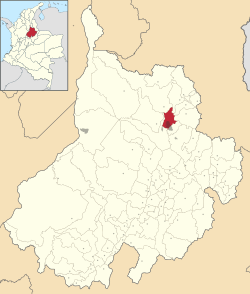 The official metropolitan area includes the municipalities of: Girón, Piedecuesta and Floridablanca, but Lebrija is home to Bucaramanga's airport and is commonly considered part of greater Bucaramanga. Despite recent urbanization, all four neighboring municipalities contain extensive rural areas. Under the Köppen climate classification, Bucaramanga features a tropical monsoon climate, though a noticeably cool version of the climate. The city is slightly too dry for a tropical rainforest climate, as its driest month of January averages just under 60 mm (2 in) of rainfall. 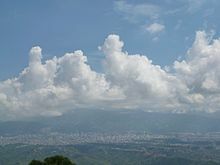 Although its altitude is not considered very high, Bucaramanga's climate is neither hot nor cold, 22 degrees Celsius being the average temperature. Compared to cities at the same average altitude (such as Cali), Bucaramanga has much cooler daytime temperatures, owing to the cold wind coming down the eastern peaks; its night temperatures are not cold, owing to the warm air coming from the canyon. These phenomena make the daily thermal oscillation narrower than in other Colombian cities. Downtown Bucaramanga, Santander Park, and the Triad building. In the recent years, several major shopping centers and commercial buildings have been built in Bucaramanga. Such is the case of the shopping center La Florida, a six-storey mall with two pedestrian bridges and one vehicular bridge. A newer shopping center, Megamall, was built in 2007, where the first store of the French multinational retailer Carrefour opened in the city. In the following years, three more shopping centers were built in other areas of the city: Cacique, Parque Caracolí and De la Cuesta. Another shopping district known as "Cabecera del Llano" includes five major shopping centers: Cabecera Etapa I, Etapa II and Etapa III as well as the more recognized Cabecera Etapa IV and the shopping center "La Quinta" or V Etapa. The Acropolis Shopping Center is located in an area known as Ciudadela Real de Minas, while the San Andresito commercial center and the traditional and renovated (2005) Cañaveral shopping center are located in the southern sector of the city along with the El Cacique shopping center, opened in November 2012 and considered one of the largest in Latin America. In these shopping centers, there are several movie theaters of major companies such as Cine Colombia, Cine Royal and Cinemark, clothing stores like Adidas, Levi's, and national brands such as Arturo Calle, restaurants and cafes as Presto, El Corral, McDonald's, Crêpes & Waffles, Juan Valdez. Historically the city of Bucaramanga has been one of the cities with the lowest rate of unemployment in the country. As of September 2010 according to DANE statistics between July and September 2010, the city had an unemployment rate of 11.8%, increasing by 3.3% compared to October and December 2009 which showed a rate of 8.5%. The Universidad Industrial de Santander is an official institution which offers 95 degrees and a wide range of undergraduate and graduate courses within the health sciences, humanities, sciences and engineering colleges. Also it offers seven technological programs in different fields through the Distance Learning Institute. Nowadays, after 65 years of existence, there are nearly 14,000 students registered in undergraduate and graduate programs, as well as a total 22,000 alumni. It proudly stands as the leading higher education institution in the northeastern part of the country and ranks fourth among official universities nationwide. Also, the University has created affiliate branches in Barrancabermeja—home of the most important oil refinery in the country—El Socorro and Málaga. Recently it has extended its services to Barranquilla and Bogotá through the offer of its Graduate Programs. 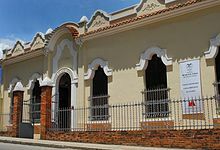 One of the main pillars of culture in Bucaramanga is literature, as in the past there was a local cultural movement that produced a number of writers. Corn arepa (arepa de maiz pelado) and tamal are some of the typical dishes of Santander. In Bucaramanga and neighboring municipalities can perform a variety of tourism, ecological tourism through its parks, adventure tourism Ruitoque table in 15 minutes' drive from the city is the "Voladero the Eagles" where you can go Paragliding. The downtown area boasts colonial buildings like the churches of San Laureano, Dolores Chapel. Some houses such as the house of Bolivar, of Louis Peru de Lacroix. Other colonial buildings are located in the neighboring municipalities of the city. Bucaramanga tourist diversity earned him being chosen as one of the seven tourist destinations of national pride through a voting process that was convened by Colombia is passion and Bavaria. Chicamocha National Park, also known as PANACHI, one of the major attractions of the region. Socorro: Located 121 kilometres (75 miles) from Bucaramanga. Cradle of the uprising of the villagers, is located in the province Comunera, northeastern department of Santander. It was founded in 1681 and 1711 he was awarded the title of "Very Noble and Loyal Villa". In 1781 Manuela Beltrán broke the edict that raised taxes and contributions, which led to the revolt of the Communards. In the main square stand monuments to José Antonio Galán, leader of the uprising, and Antonia Santos. Other attractions are the house of culture and the cathedral. San Gil: located 96 kilometres (60 mi) from Bucaramanga. The historic center of the town with steep streets and on the banks of the river Fonce National Monument. One of its main attractions is the park The Gallineral, occupying an island in the river, the moss hanging from the trees and the sound of water make it a must-visit site. Bucaramanga has the Estadio Alfonso López, with a current capacity of 28,000. This stadium is the home of the local football teams Atlético Bucaramanga and Real Santander. In 2010 began the construction of the Alejandro Galvis Ramirez Bicentennial Coliseum for the Futsal World 2011, an event that was held in Colombia. Futsal is a 5-a-side indoor version of football. The average amount of time people spend commuting with public transit in Bucaramanga, for example to and from work, on a weekday, is 57 minutes. Ten percent of public transit riders, ride for more than 2 hours every day. The average amount of time people wait at a stop or station for public transit is 14 minutes, while 19% of riders wait for over 20 minutes on average every day. The average distance people usually ride in a single trip with public transit is 5.6 km, while 10% travel for over 12 km in a single direction. ^ a b c d "Estimaciones de Población 1985 - 2005 y Proyecciones de Población 2005 - 2020 Total Municipal por Área (estimate)". DANE. Retrieved 10 November 2016. ^ "Asoinducals" (in Spanish). Asociación de Industriales del Calzado y Similares. Archived from the original on January 6, 2013. Retrieved February 1, 2013. ^ "Actividades y compromisos" (in Spanish). Asociación de Industriales del Calzado y Similares ASOINDUCAL'S. Archived from the original on January 6, 2013. Retrieved February 1, 2013. ^ "Calendario de Eventos en Bucaramanga 2010 Cenfer". Centro de Ferias, Exposiciones y Convenciones de Bucaramanga CENFER. Archived from the original on January 8, 2010. Retrieved 29 January 2010. ^ "Maria de Jorge Isaacs por menos de 10 mil pesos" (in Spanish). Archived from the original on July 21, 2011. Retrieved February 1, 2013. ^ "Las Hormigas Culonas" (in Spanish). Retrieved January 28, 2019. ^ "Bucaramanga Public Transportation Statistics". Global Public Transit Index by Moovit. Retrieved June 19, 2017.